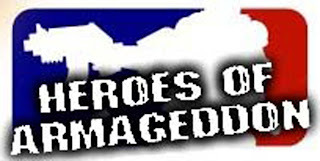 Battleroad Games, located near Boston in Massachussetts and with an online presence at www.battleroadgames.com and on Ebay, has been extremely generous to the Heroes of Armageddon Project. This week we will be giving all their wonderful donations away, thanks to Alex from Battleroad. He believes in the cause of helping Doctors Without Borders and he loves the hobby and the gaming, in short he is allright and an upstanding citizen to boot. Check out his store if you are near Boston or go to his ebaysite/website for sales on stuff. I mean, I will get to draw SEVEN winners this Sunday! Thank you Battleroad Games! So make sure you donate some money to our amazing project using the paypal link on the top right and you might be the one getting a awesome new model in the mail. 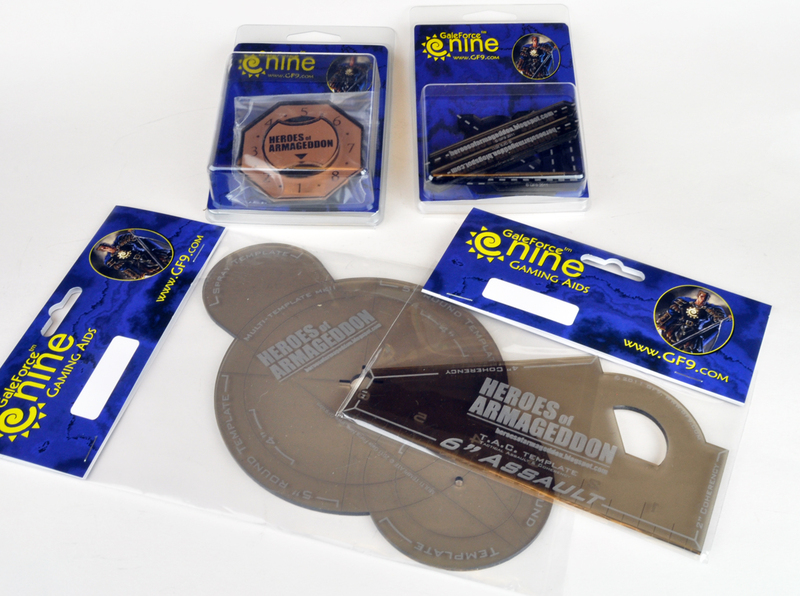 Sponsorship from Gale Force Nine! 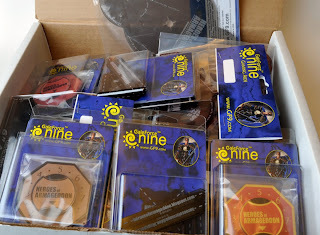 On Friday a nice big box was delivered to my front door from Gale Force Nine! When I opened it up it was full of the templates for the Heroes of Armageddon project. 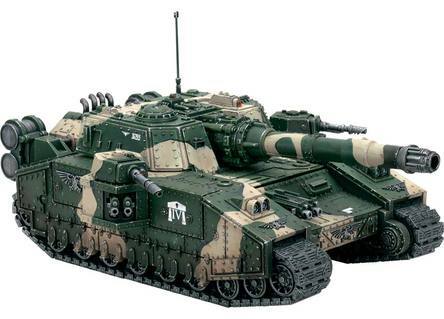 One set for each of the four armies. Very exciting stuff. There's a set for each of the armies, so the four winners will have matching equipment to go with their spectacular force. If you're a store owner, you can talk with your Battlefront Customer Service rep. Note, you'll need a minimum of 24 items to get started. 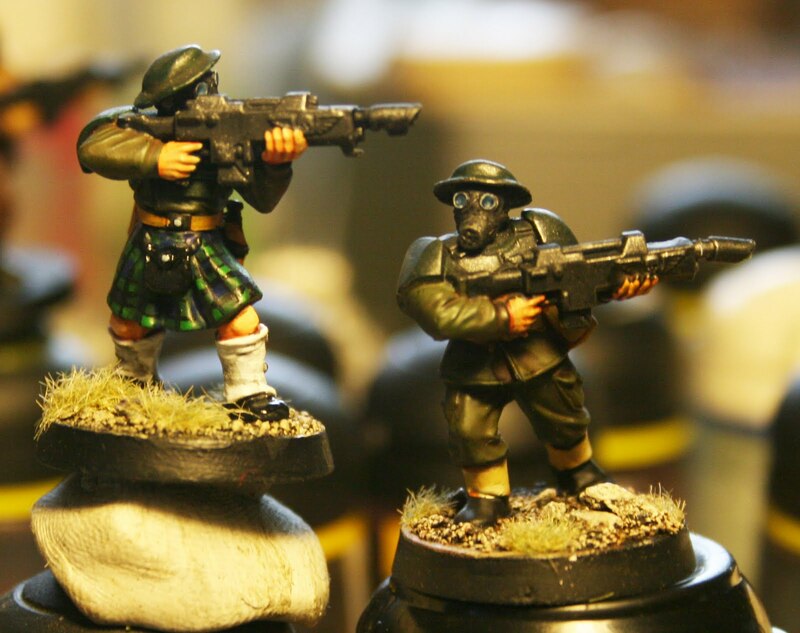 I quickly jumped in and grabbed out everything for the Steel Legion army. 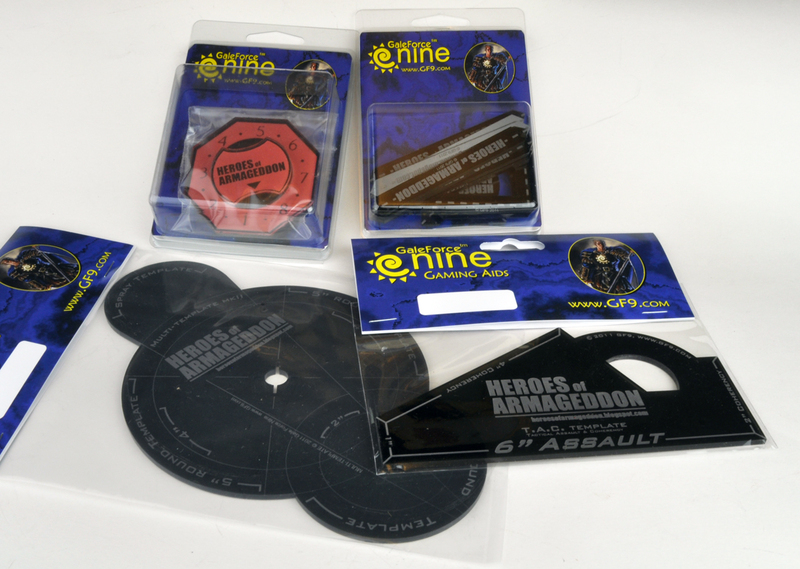 Here they are (above): a Turn Counter, a set of Deployment Zone markers, one of GF9's great Multi-Template, and one of the great GF9 T.A.C. Templates! 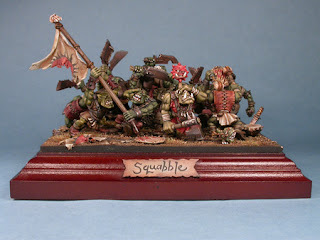 Here are the same templates for Ghazghkull's Ork Horde, in deep green as befits this mighty army. 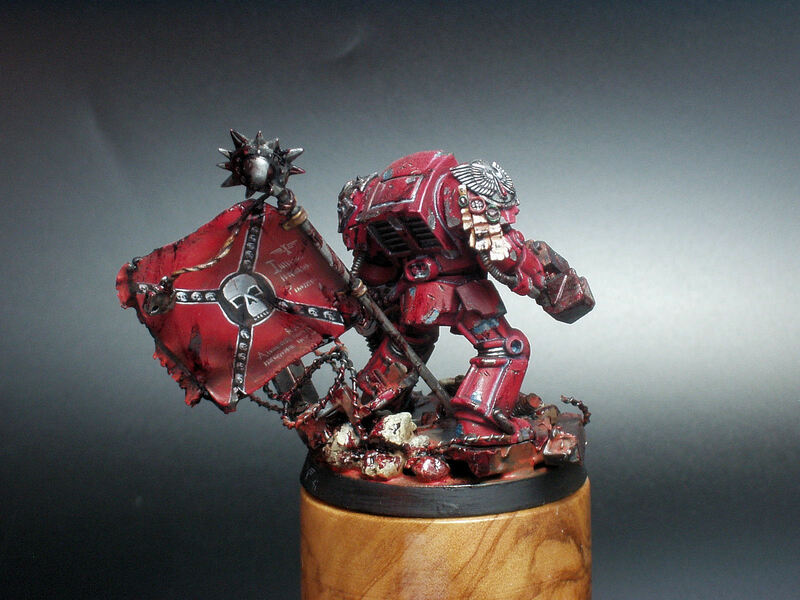 And a set of red templates for the Speed Freakz army, because everyone knows "red ones go faster"! 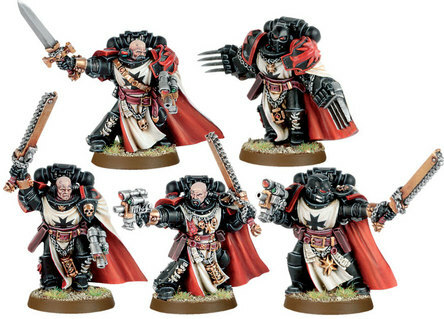 And finally, to complement the great looking Death Company and Stormraven models, we opted for an almost black for the Blood Angels army! Thanks very much to the team at Gale Force Nine for these great additions to the HOA Project. Donate now by clicking on the Paypal button in he right column! 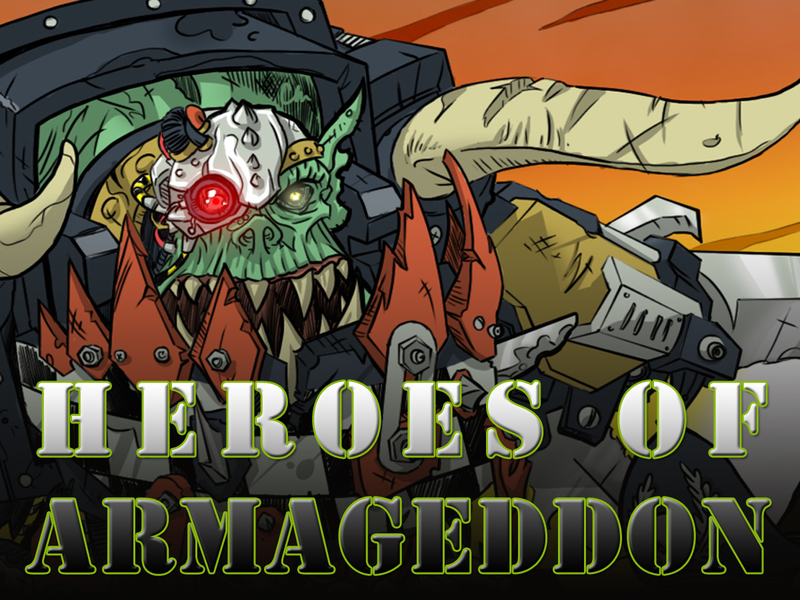 Heroes of Armageddon + From The Warp Weekly Drawing Winner! 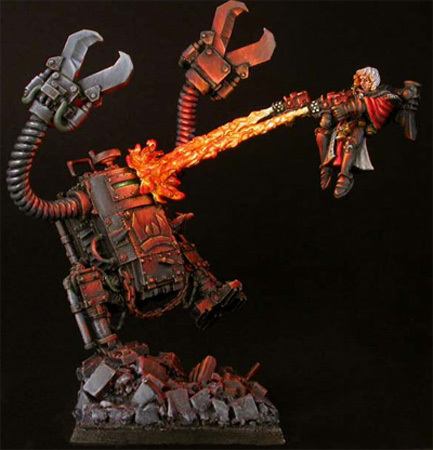 Oscar has won a new Finecast Terminator Librarian donated by Game Vault and painted to a high standard in his favorite chapter specs by Ron of From the Warp! Congrats Oscar, thanks for your donation, and you are still in the running for the grand prize army drawing at the end of the build in July right before Games Day USA. 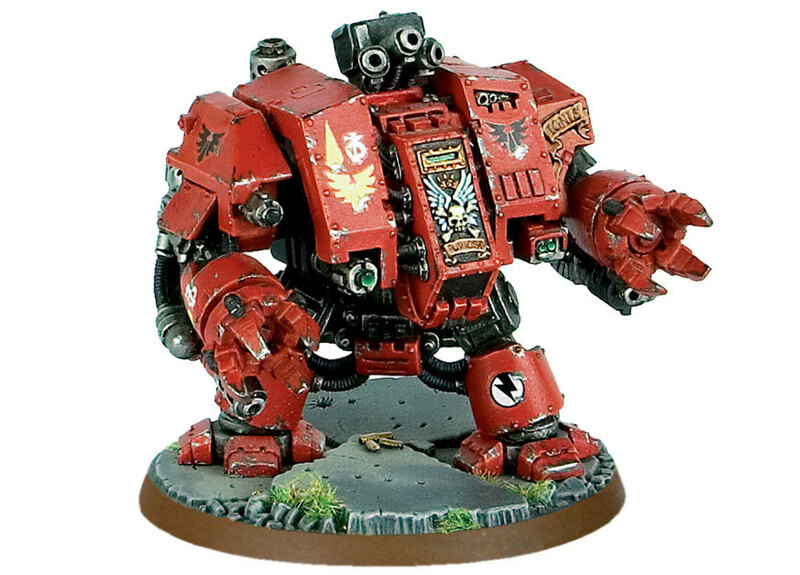 In the next few weeks more and more progress pics will be up on the build team blogs and you are going to see some awesome finished models as we gear up for the drawing. 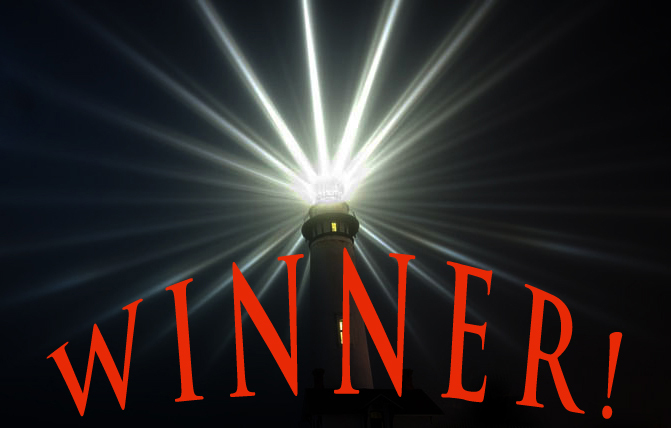 Thats right this weeks weekly drawing is being donated by Ron at FTW. 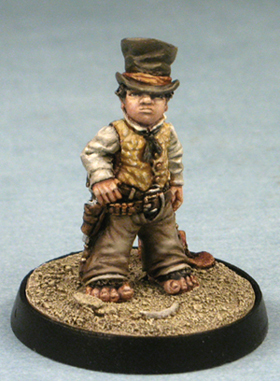 Ron has a new Finecast Termie Librarian donated by his FLGS Game Vault. 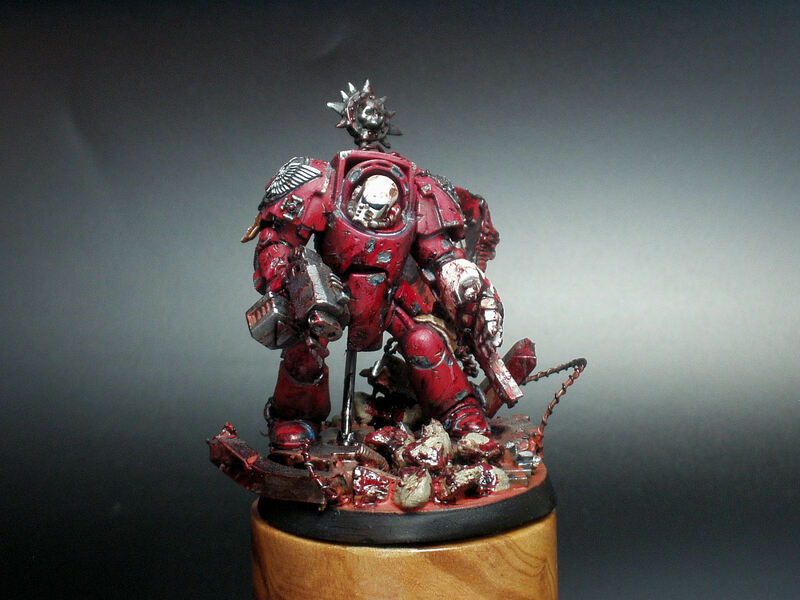 The winner of this weeks drawing will have it painted up to their specs by one of the best. Check out the details at Ron's post on FTW winner will be draw from the names of all who have donated to The Heroes of Armageddon project at that time, so if you have been holding off, now is a good time to toss a few $ in the pot and it going to a great cause. Be sure to check out this blog tomorrow for a very special guest blogger with a prize for this Sunday's Heroes of Armageddon weekly prize drawing. 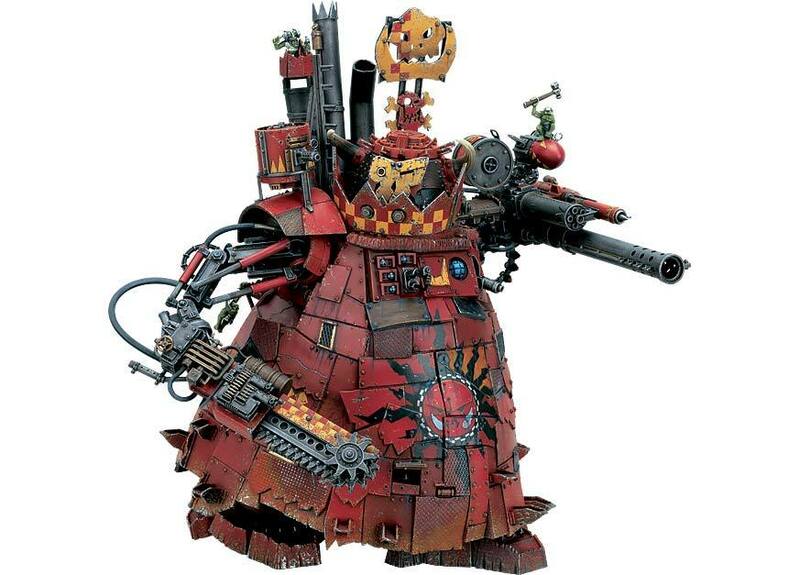 The mystery blogger is an old friend of Santa Cruz Warhammer and is offering up a great prize for this week. 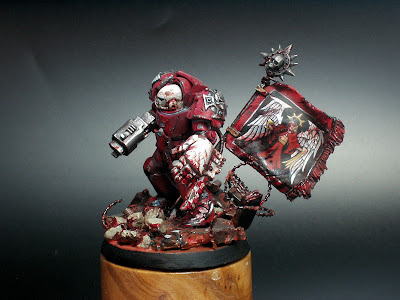 Death Company Storm Raven, Part 5: the finished model! Here's the full shot with the front door open. I painted the entire interior but nothing of it will show, except the front part. it's a matter of principle for me, but still a bit disappointing that this model lets very little light in when the hatches are open. The engine goes from silver to brown to black, which looks nice. This plane will fly off to Chicago and will be one of the models for the Blood Angels Army that will be given to a lucky donater. 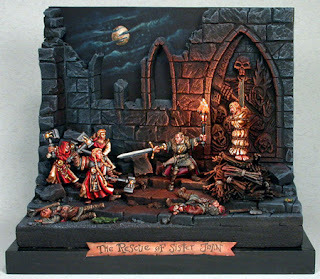 REMEMBER: if you want a chance to win this and many other great models, please donate some bucks through Paypal. 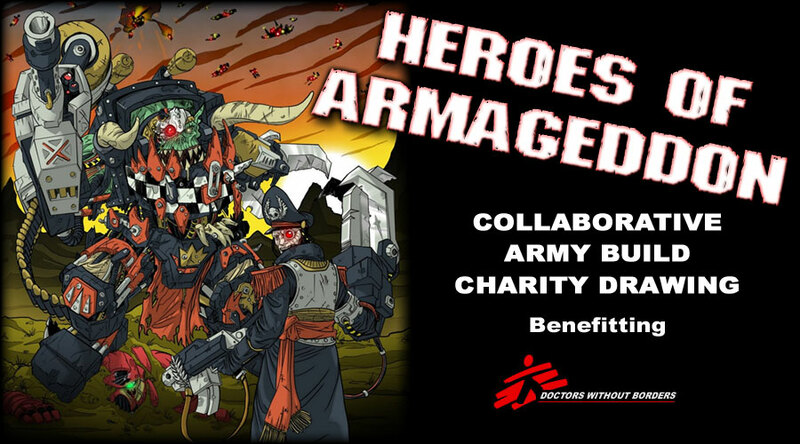 ALL the money will go to DOCTORS WITHOUT BORDERS. Here's their newsfeed for this week: pretty amazing work they do...check out the person that go arrested in Bahrein without reason and thankfully released again without charges after weeks of jailtime for no reason. Heroes of Armageddon - Weekly Drawing, Winners! 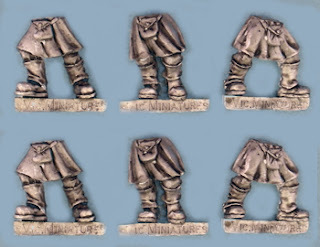 Thanks again to Victoria Lamb of Victoria Miniatures and to everyone who has pitched in so far, stay tuned for the next drawing, also keep an eye on the blogs for in progress pics as the models start getting finished and watch the Grand Prize armies grow. This weeks Heroes of Armageddon Weekly Drawing prizes come from Victoria Lamb of Victoria Miniatures. As mentioned before, Victoria was kind enough to donate the head and pack bits for the Savlar Chem Dog squad I am doing for the Steel Legion Raffle Prize army led by Dave Taylor. 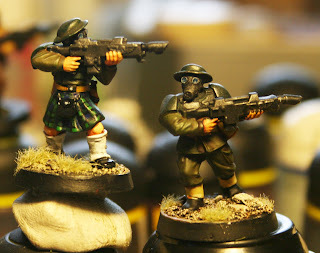 I am also using her kilted legs for my personal Ardwick 23rd Imperial Guard Veterans. 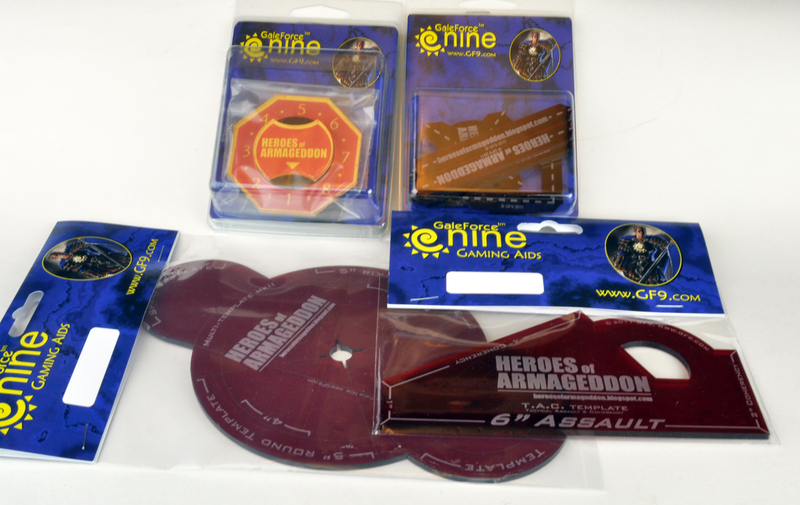 Victoria has been kind enough to send a few of her products to us to raffle off for this weeks Heroes of Armageddon drawing. 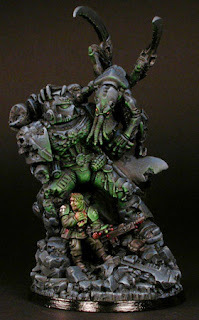 Victoria Lamb is a multiple Golden Demon winner and the awesome builder / painter behind a number of my favorite models and mini dioramas. Her OSL effects were way ahead of the times and awe inspiring. Here's a few of my favorites ( all following pics from her website). 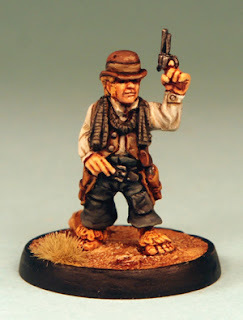 Victoria also sculpts her own offerings for sale and Victoria Miniatures offers some great miniatures and bits, be sure to check out the webstore. The 3 winners will be drawn at random on Sunday from all the Heroes of Armageddon Donations at that time, so if you have not yet made a donation or would like to throw in a few more bucks to this great Charity cause, get to it and sweeten your chances of winning some of this great stuff. Weekly drawing winners are also still eligible for the grand prize army drawing ant the end of the project. Ten Chemsoldiers from Troll Forged Miniatures. Thanks to them for this great and generous donation. 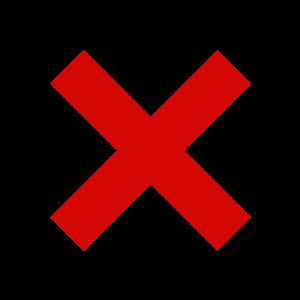 Support them if you can. The Heroes of Armageddon blog has all the great and generous companies and individuals list for you all to check out. Congrats to Patrick! 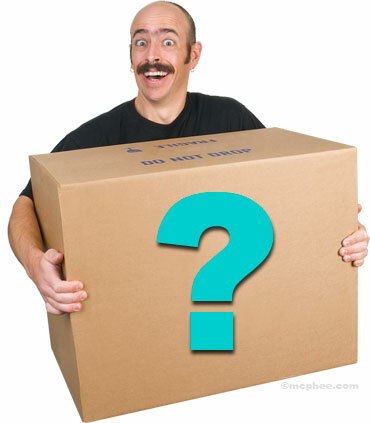 Remember, we still have some amazing prizes to give away, stay tuned for this wednesday! You can win by supporting the GOOD cause with the paypal link on the top right. Heroes Prize: 10 Troll Forged Miniature Chem Soldiers! Troll Forged is a community of amateur sculptors who all post their work on their own forum. Readers can comment on the sculpts, after which the best ones get molded and cast. They are put up for sale on their store and each sale gives the sculptor a commission, which never ends. In this way sculptors can keep reinvesting time and money to get better and keep at it. The brain behind this group is Ed Fortae, who is the sole caster. I thought it was all too good to be true and I sent him an email, requesting some of those Chemsoldiers, which would make great IG troopers. Hm...it took about an hour before Ed emailed me back and said, YES of course I will give some models for the cause and he sent me 10 Chemsoldiers which we are now giving away for Heroes of Armageddon! 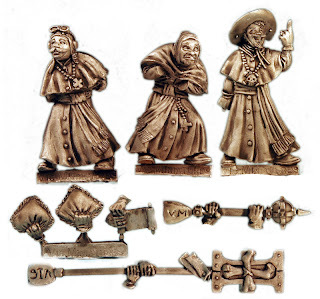 To support Ed and his friends visit Troll Forged Miniatures and check it out, it's REALLY interesting stuff. This Sunday we will draw ONE lucky winner. You all know the drill: donate with Paypal and support a GOOD cause! Congrats to Joel and thank you for being generous to the cause. Joel will still be able to also win one of the four armies. 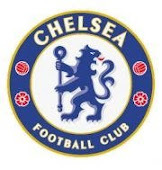 The drawing for that will happen in about 5 weeks! This coming wednesday we will have many prizes: miniatures made in the US and made in Australia. Stay tuned! Thanks to Simon M. for his generous donation of the model. Check out his blog and do a search for his models on CMON. Excellent stuff! 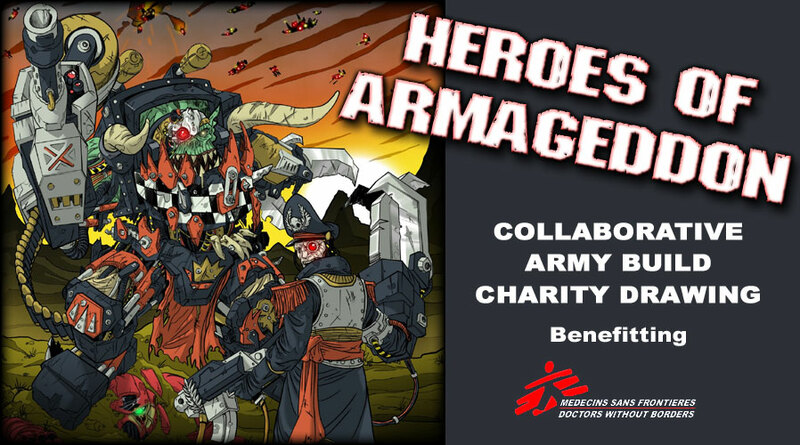 German painter Simon M gives to Heroes of Armageddon! 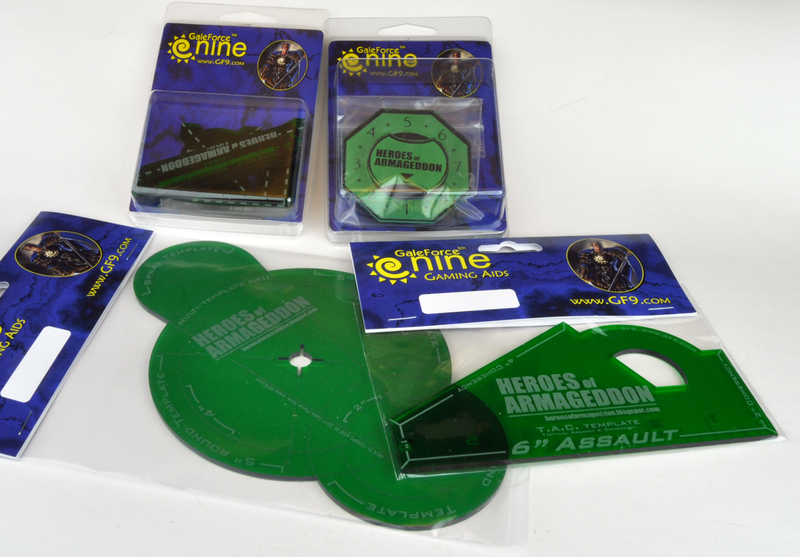 Every week, for the last 6 weeks, we have given away a prize to one of the contributors to the Heroes of Armageddon Project. Anyone who donated 5 bucks or more using the Paypal link on the right, was in the mix to win and we have had winners from all over the world. 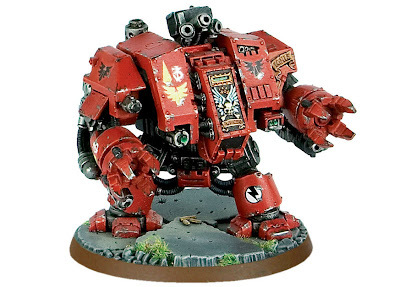 It's certainly a wonderful model and would look great in any glass case or on the battlefield...if you want to win this mini, you will have to donate some bucks to the Heroes of Armageddon; ALL THE MONEY GOES TO DOCTORS WITHOUT BORDERS, so you are doing a good thing, no matter what. Link on the right top of the blog. We appreciate it. 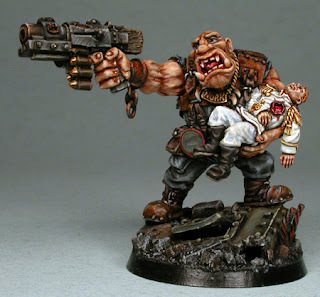 For more of Simon Modrow's stuff go to his blog or check out his gallery. Amazing stuff. Next week: prizes from Down Under!